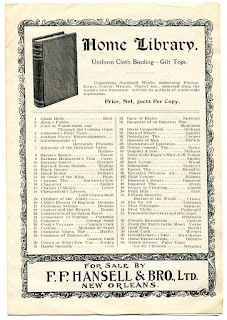 This 1895 ad cover for the book store claims its superior physical beauty, yet refrains from an illustrated representation of the premises on its business stationery. Did handsome apply to the exterior, interior, or both? What were the criteria for such a superlative? Many other postal covers I've seen for like establishments have included illustrations of the building in which they set up shop. 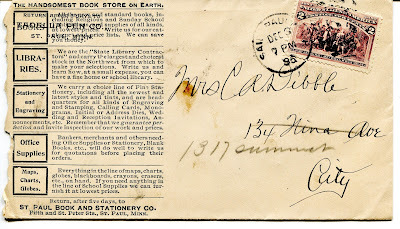 St. Paul Book and Stationery Co. chose to use that space on the front cover of the envelope to tell you something about their business. I would argue that was much better use of the space. Instead of looking at the handsomest book store you ever saw, you could learn something about the business, which just might lead to your patronage in that handsome space. 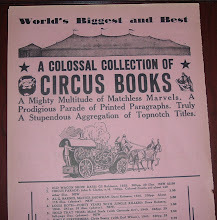 You could learn about the kinds of books they stocked, their ability to help you start a home or school library, the stationery products and engraving services offered, the variety of office supplies on hand, and maps, globes, and charts, as well as other desirable school supplies. And if you decided to visit their store, I suppose you'd just have to judge for yourself how handsome the place was and if it lived up to their claim as the handsomest. 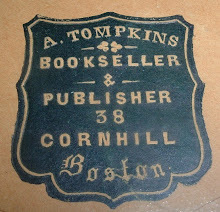 In an 1889 edition of Caspar's Directory of the American Book, News and Stationery Trade, I found an entry for St. Paul Book and Stationery Co., which indicated that the business got started in 1879 under that name, but its origins went back to 1859 under different ownership.But I haven't been able to find an image for the shop at the address on the cover above. In absence of any evidence to the contrary, they get the benefit of the doubt for having been the handsomest book store on earth. 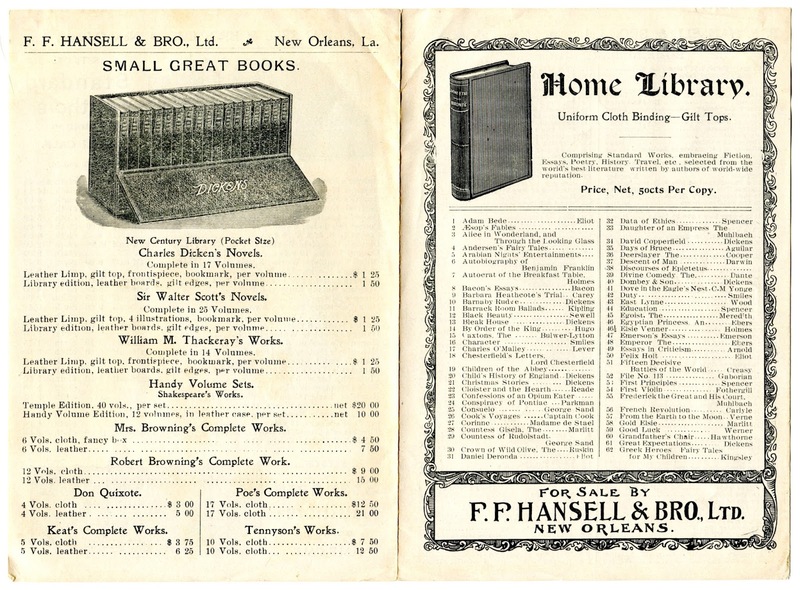 In 2009, I blogged about an old billhead from New Orleans bookseller, F.F. Hansell &Bro., dated 1900. 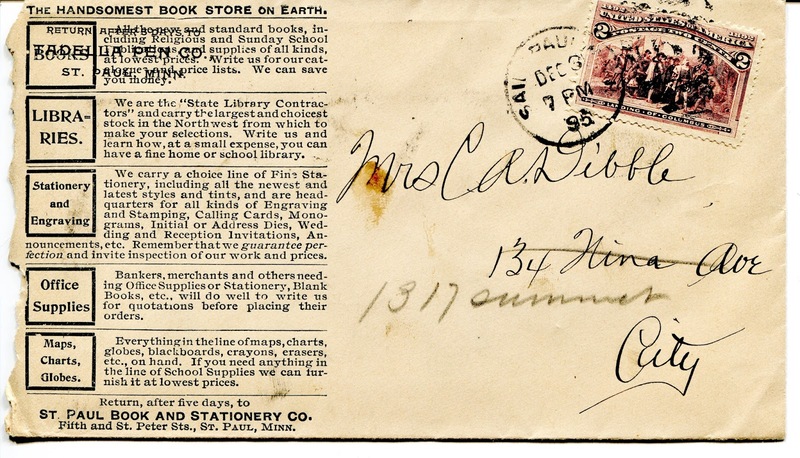 There wasn't much information on that piece to indicate what kind of stock Hansell had in his store, but comments on that post indicated office furnishings were in the mix along with a few books. I wondered if they sold "real" books or maybe just account books and ledgers for businesses in addition to a few school texts a standard author or two. That question was answered with a recent addition to my collection--a Hansell brochure/catalog of popular books and standard authors representing an impressive inventory of quality literature. Real books. 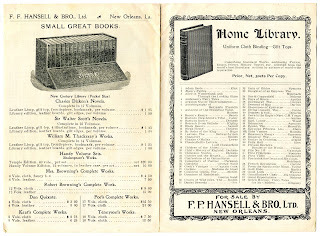 This undated (appears circa 1900), 7 X 10-inch folded sheet features Hansell's Home Library on the front (and continuing on the next page), with 204 cloth-bound volumes dressed in gilt tops to choose from. Titles such as Aesop's Fables, Alice in Wonderland, Emerson's Essays, Carlyle's French Revolution, Robinson Crusoe, Swiss Family Robinson and on and on. Standard works in literature, history, travel, etc. 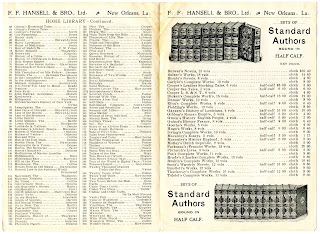 Page three above advertises Hansell's multivolume sets of standard authors, bound in half calf. Here you would find Dickens' Complete Works in 15 volumes, Gibbon's Roman Empire in 5 volumes, and many others considered standard authors of the day. 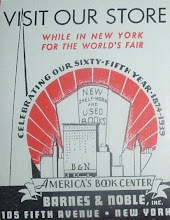 Thomas Nelson's name keeps coming up as publisher in repeated searches for these pocket size editions, though the publisher is not named in Hansell's brochure. It's doubtful that F.F. Hansell used the same name as Thomas Nelson did for their multivolume sets. 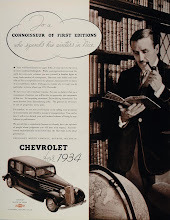 Regardless of the publisher, this little advertising piece shows that not only did F.F. Hansell deal in "real" books, they offered an impressive array of literature in various affordable editions and bindings for the reader or student of serious literature.